Very well-behaved stallion. He has been competing with a girl: Placed 1.35 m, ready for 1.40 m. Wonderful horse for the hunter and equitation ring. Well brought on Hanoverian State Premium Mare with fantastic riding qualities. Winner in dressage test for young horses at medium level. Ready for the advanced class. 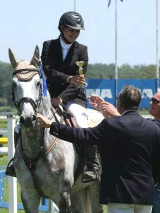 More than 90 successes, including wins up to 1.30 m class. Experienced ribbon collector, ideal for lady riders and junior riders. Victorious in 1.10 m young horse test, ready for 1.20 m. Uncomplicated horse for almost any rider. Expressive black dressage horse on his way to Grand Prix. Confident command of movements. Winner in S dressage, ready for Inter II and Short GP. Perfect for ambitious amateur ladies. Dreamlike schoolmaster for the internationally advanced classes. Great jumping talent, strong nerves and a calm character. Many wins and placings up to 1.50 m.
Placed 1.10 m and 1.20 m, ready for 1.30 m. Excellent show jumping breeding. Kind, cool, always keen to jump. Very nice for ladies. Successful relatives at international level. Athletic horse in training with great jumping talent. Eager to work, honest, pleasant to ride.